My pumpkin patch soil has been a bit jacked up for a while now in terms of potassium and phosphorus. The numbers have been too high for about 3 years now so I haven't added any potassium or phosphorus to the soil other than what comes with the compost. My latest soil test came back today and potassium and phosphorus are still high but they are coming back down to where I would like to see them. The thing that pleased me the most is cation saturation is pretty much in balance for the first time. Calcium is at 64.4% and magnesium is at 19.8%. Ideally you want those two numbers added up to equal 80% and we are close enough to that. My potassium is high so that will inhibit a little but I think we are okay. The cation saturation is difficult stuff to understand but basically it can tell you how well the plants can get nutrients from the soil. This article is a nice simplified explanation of how it works. If you are looking for more information you better get your PHD on because there are lots of articles that are over my head. I saw that the forecast called for 60s and 70s here in Denver for the next five days so I put in a cover crop today. The seed mixture included winter rye, winter oats and vetch. I planned on putting those seeds down during the fall but a busy schedule and a very cool late fall didn't allow me to do that. I suspect with these warm temperatures that the seeds should germinate just fine and make for some nice green manure the end of April. They should also help get the myco going in the soil a little earlier. Time to start thinking about pumpkins. 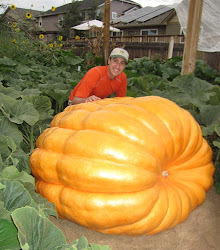 We'll actually thinking about pumpkins for most giant pumpkin growers is a year around thing, but now it is almost time to get back to work again. I took advantage of some very nice Denver weather to get into the pumpkin patch and take some soil samples. To know what to add to your patch during your spring patch prep you need to know what to add to your soil. Each spring and often times in the fall I'll send in soil sample to A & L Western Agricultural Laboratories to get my soil tested. To test your soil get a clean spoon that is free of rust and dig down to about 8 inches in about 12 different places and put the soil in a zip lock bag until you have about 1 1/2 cups. Don't touch the soil at all with your fingers. A drop of sweat or a flake of rust can throw off the soil testing because of salt that can come from your hand or rust from a shovel. Usually within a week or so you'll get your soil test results and for a few bucks more the results will come with instructions on what to add to the soil. I usually send my test results to a few local growers and a couple of heavy hitter pumpkin growers asking what I should add to my soil in the spring. The answers I usually get back are somewhat varied (there is a lot of science that goes into soil and plant studies but the science isn't very clear and growers experiences and opinions vary). Based on the feedback I get I'll add additional amendments in April and till that into the ground. I was pleased to run into a few worms in the patch while digging around. I didn't expect to see any thing time of year. I see lots of organic material in the soil and it has a nice, dark earthy smell to it. If I can get some time away from my website business I hope to grow big this year. I've got to get over 1,000 pounds.